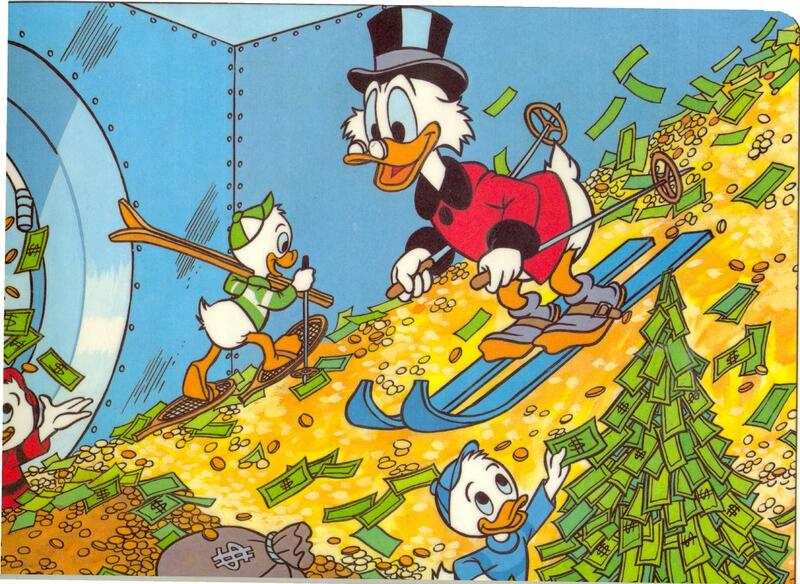 When I was younger, my idea about being successful in my career centered around having a vault like Scrooge McDuck. It would be full of gold coins and have a diving board, and when I dove into it, I’d surface with a big crown on my head and strings of pearls around my neck and gem-stone rings on my fingers. That’s right. Woohoo! I don’t even know how to ski…but I’m willing to learn if I have some money to ski down! I assumed whatever job I had would make this money (artist, archeologist, teacher, waitress, professional book reader, poet). And then I got my first job working at the Five Star Diner. It was dirty, hard work. My bosses had this old-school ‘indentured servant’ approach to my time there. There was no buspan too big or under-the-booth spill too small for me to haul or scrub on my hands and knees…for $43 a shift! At 14 (I was an under-the-table laborer), $43 was a fortune. Maybe my vault wouldn’t be full of that many dollars (though, if I exchanged for pennies, I’d be able to dip my toes in! ), but I could buy so many things. One movie ticket, one CD, one diner meal, AND one book. I’m trying to think of more examples of things I’d want, but, at 14, I had very few desires. This picture sums up the way I felt about spending money at 14…but I also just ate a Reuben, saw Romeo + Juliet, and am listening to the new Bjork while I peruse my books. LIFE IS GOOD! By 16 my parents had built a horrible 50’s style restaurant, and I waitressed there. Sometimes people hear that I was the owners’ daughter and assume I had it easy. My parents expected longer hours, better service, and zero complaints from me. I spent many an unhappy second shift covering for some girl who called in at the last minute because she’d been invited to another prom unexpectedly or won free tickets to see Bon Jovi. The work was degrading and awful, but the money was good. I didn’t drive, so there were no vehicle expenses. I basically just shoved my money in my sock drawer, then, when I couldn’t take out a pair of socks without a dollar bill shower, I took it to the bank. After a few months, I had enough to blow on a seven-week backpacking adventure through Ireland and England with my little sister. We were young, we were wild, there were Blarney Stones to kiss, pints of Guinness to taste, museums to avoid, and MTV Euro to watch at hostels all over Ireland. It was money very well spent. How do you make years of endless shifts waitressing under your parents’ unrelenting thumbs hurt less? Well, this is a start! College jobs included waitressing (I’m serious…it never ended! ), tutoring, and being a guard at an art museum. I carried a huge course load, studied until my eyes bled, and lost any pigment in my skin from never seeing the light of day. My money went to things like textbooks, tuition payments, and food. Which was usually a box of Bisquick and a large container of Ramen, so I could alternate sweet pancakes and salty soup. It was a dark time where I scraped by on a fairly meager existence. My sole comfort in life. Thank you, pancake. Okay, sidenote: I totally love Hillary! But she and I were getting really, really excited about dreams that…um…just didn’t come true. Sigh. $22,900 seems like SO MUCH MONEY if you are a young college grad who’s never paid real bills. And, by ‘real bills,’ I do NOT mean putting money in the IHOP pancake jar (mmm, how did they manage to make them so much better than mine?). I soon found that little things cost a lot. Like a roof over your head that your parents are not providing. Or heat. Or eating every day. Or water. Yep. You have to pay for your own water! But I was bound and determined. I kept going to school to get my official teaching license, all the while working at Home Depot and living with my parents. And I finally got a real teaching job that made my first job look like small potatoes! Okay, maybe it wasn’t the Scroooge McDuck vault, but I had things like dental insurance and a 401K. I should have been SO HAPPY! And there were many happy aspects to teaching. BUT…part of me felt like Katniss when Prim’s name got selected for the Hunger Games. Every day. It was a lot of survival. Which is fine. New teachers have to do that. They have to survive. But being Katniss for four years wound up making me feel tired. And I didn’t have Peeta on my side. District 12 is totally fun to read about…but I like things like pancakes and sleeping in and romance too much to actually live there! I was writing. Sneaky writing. Sneaking my laptop into the livingroom late at night so I wouldn’t bother my husband with my ‘hammer fingers.’ And I knew, I knew right to the bottom of my soul that I wanted to be a writer. It was the first time I wanted a job without having any idea what kind of money I’d make. My husband and I talked and talked…and talked about it. We came up with a budget and a bottom line number. If I could make that number writing for a certain amount of time, I could probably BE a writer. Like, writing would be my job. So I put my books out there and held my breath. Readers, bloggers, the writing community was amazing. I hit my number. I even crept a little past it. It wasn’t a Scrooge McDuck number! I’m not sure if there will be any vaults full of gold in my future. But I get to be a writer. And even if I can’t afford IHOP pancakes, my husband makes the lightest, fluffiest ones in the world. And his pancakes make me want to write more, better, longer, more amazing!! I want to BE A WRITER!! So thank you if you bought one of my books! Thank you if you liked it and told a friend! Thank you for taking a chance on one kid’s dream. SQUEEE! I WROTE THAT!! I’M A WRITER!!! WHEEE!!! Don't forget about the goodies! In addition to A.W.R. having a giveaway for a copy of Forgiving Trinity, this tour is also having it's own giveaway. That's SEVEN chances to win! All you have to do is fill out the form below. One entry per person! Both giveaways end April 20th (In the event Rafflecopter hates me, you can leave your email for the A.W.R giveaway below). PREET!! I LOVE that I'm on your blog! And you, natch!! Smooches!! And thank you for giving me crazy free reign to write about my aspirations to be Scrooge McDuck! Duckatles wooohooo! Thanks again Liz! I adored your post...And now have a craving for pancakes. Ha! I love that you dreamed of having a vault of money, then went into teaching. :-D Actually, I loved this WHOLE post! So funny and charming and honest.